Open-pit mining occurs on surface and is generally the cheapest way to extract ore. This is because rock doesn’t have to be moved far up hill against gravity, equipment used can be larger than underground, and it doesn’t require more expensive features like ventilation, communications, etc. that underground does. Open pits are designed and engineered to allow drilling and blasting of the orebody and of the waste rock around it. The design also ensures that the slope of the pit walls is safe. In the North, the rock surrounding an orebody is apt to be Canadian Shield granite, which provides strong and stable pit walls. To access the orebody, first the overburden (rock, soil, and silt on top of the ore) must be removed. Open pit mines may be circular, like the ones shown pictured at the Ekati mine, or oblong, and include several mining levels know as benches. Roads, known as ramps, allow access to the orebody. The size and depth of an open pit is a balance of how much worthless waste rock must be mined to gain access to the valuable ore. The size of the first bench is critical as each subsequent bench is smaller. The amount of waste rock mine compared to ore mined is called the strip ratio. In the North, open-pit mining comes with a unique set of challenges. 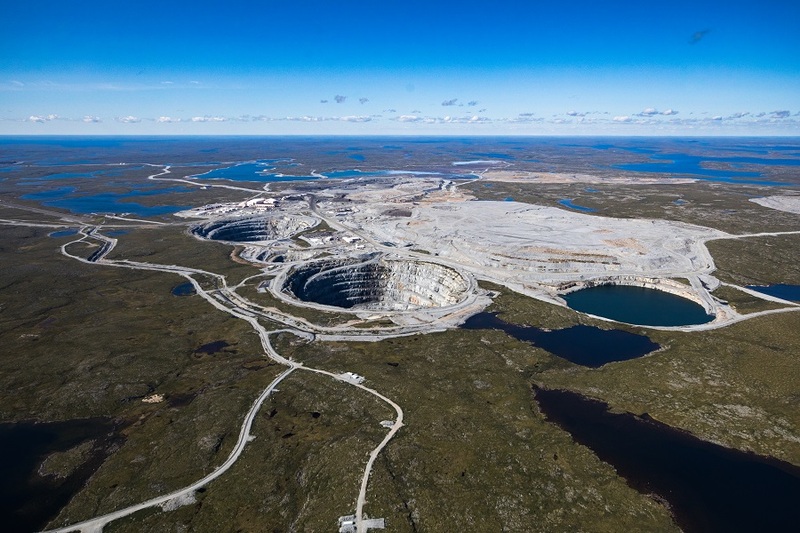 For example, at the Diavik Diamond Mine, the diamond bearing orebodies, known as kimberlite pipes (volcanoes which brought diamonds to surface 55 million years ago), were under shallow waters of a large lake called Lac de Gras. To safely open-pit mine the kimberlite, water retention structures (dikes) were constructed in the lake to hold back the lake waters during mining. The main cost advantage of open-pit mining is that it allows mining with more efficient larger equipment. This means faster production and mining of lower grades of ore is possible. It also means potentially bigger revenues early as the mine prepares to go underground and mine the deeper parts of the orebody. The open-pit mining cycle includes drilling ore and waste rock, loading drill holes with explosives, blasting, ore loading and hauling to stockpiles for processing, waste rock loading and hauling to the waste rock storage pile. Occasionally, drilling and blasting ore is not required and can simply be removed by what is known as free digging. As the open pit gets deeper the work area gets smaller and smaller limiting equipment access.